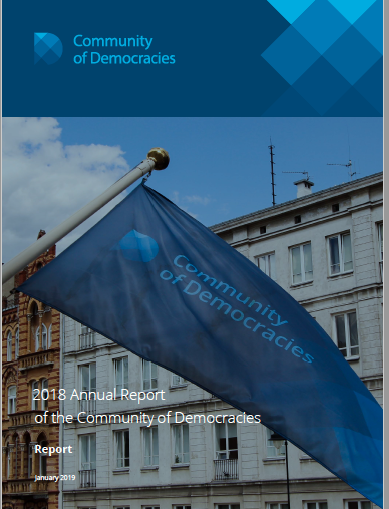 The Permanent Secretariat of the Community of Democracies is pleased to present the Community’s 2018 Annual Report. The past year, with both democratic challenges and opportunities, saw Member States of the Community’s Governing Council reaffirming their belief in the values and principles of the Warsaw Declaration and recommitting their support to further strengthen democracy both within and outside the Community. One of the major highlights in this respect was the adoption of the Community’s Strategic Plan for 2018-2023, which reflects the commitment of the Member States to strengthen cooperation to effectively respond to complex challenges to democracy and embrace new opportunities. The Community’s continued institutional strengthening was also reflected in the implementation of its new visual identity that included a fresh logo and redesigned website. Throughout the whole year, the CoD continued to work towards vital democracy-related issues, such as the promotion of Goal 16 of the UN 2030 Sustainable Development Agenda, increasing women’s political participation, youth empowerment, and enabling and protecting civil society.